As I mentioned previously, as the day of the eclipse approached, I worried about a lot of things going wrong, but the biggest and most important concern I could not control. Despite the ever-changing forecasts all pointing towards at least a cloud cover, on the big day the sky was a brilliant blue with just a few cumulus clouds floating above. It was not until today, when Dad was outside playing snake hunter with our neighbor Vincent (the viper was hiding in the bush near the hot tub, FYI), that I remembered that I had done something to guarantee perfect eclipse-viewing weather. 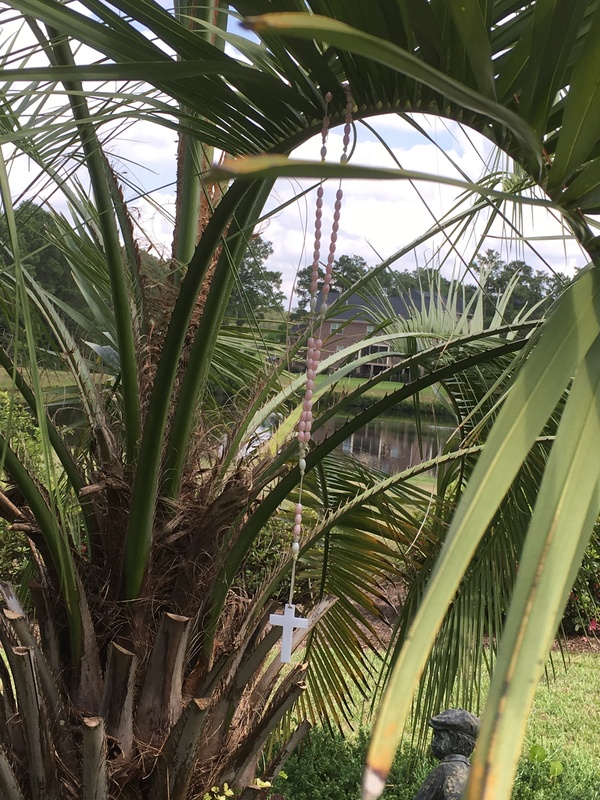 How could I have forgotten that several weeks ago, I resurrected Grandma’s old Irish family tradition of hanging up the rosary beads outside? In our family, the practice involved hanging them from a clothesline about a week or so before a wedding. As far as I know, the custom never failed, so I thought, why not? Having no clothesline in our yard, I improvised by using a palm tree, reasoning that my dearly-departed ancestors were flexible. We have all been lured into attending the “got-to-see” movie, watching the award-winning television show, or reading the latest best-selling book, but then wondered what the hype was all about. So when I read the stories about the total solar eclipse which was coming to our corner of the country, I kept my fingers crossed and hoped that the rare event would not disappoint me. We crafted a menu, shopped, shopped some more, and then shopped one more time because I worried that we would run out of food. I bought new pillows, sheets, and towels, because I did not want our houseguests to have worn linens. I baked muffins, breakfast breads, cookies, and brownies, and then worried about what would happen if the lodgers in our home did not like each other. How awkward would that be? Each day, I checked the long-range forecast for the one thing out of my control—the weather. What would we do if the skies were cloud-covered or if we had one of our typical afternoon thunderstorms? Fortunately, everyone seemed to enjoy each other’s company, the food was plentiful, and when we awoke yesterday morning, the chance of rain was slim. We watched the eclipse dance its way across the continent on television, and around one o’clock, we went outside and took that first peek. It looked like a cookie with a bite taken out of the corner. 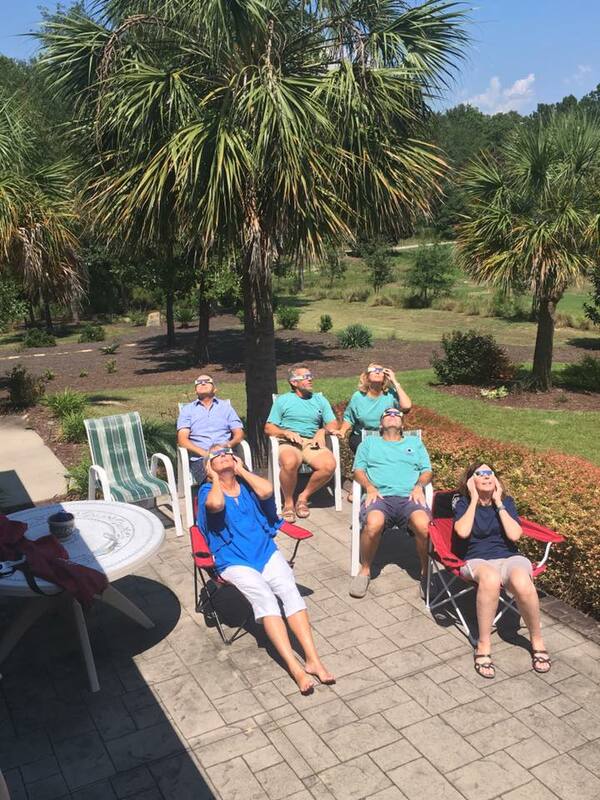 Every few minutes, we returned to the yard, all the while watching the event travel across the U.S. At 2:30, we all positioned ourselves outside with our eclipse glasses in place and our eyes facing skyward. The surroundings had an unusual appearance—not quite the same familiar color that we usually see at twilight. It is hard to describe, but something about the light was just not quite the same. Then the moment arrived: 2:41 pm EDT, and we were allowed to safely remove our glasses. While I was expecting the sky to be completely dark, that was not the case. 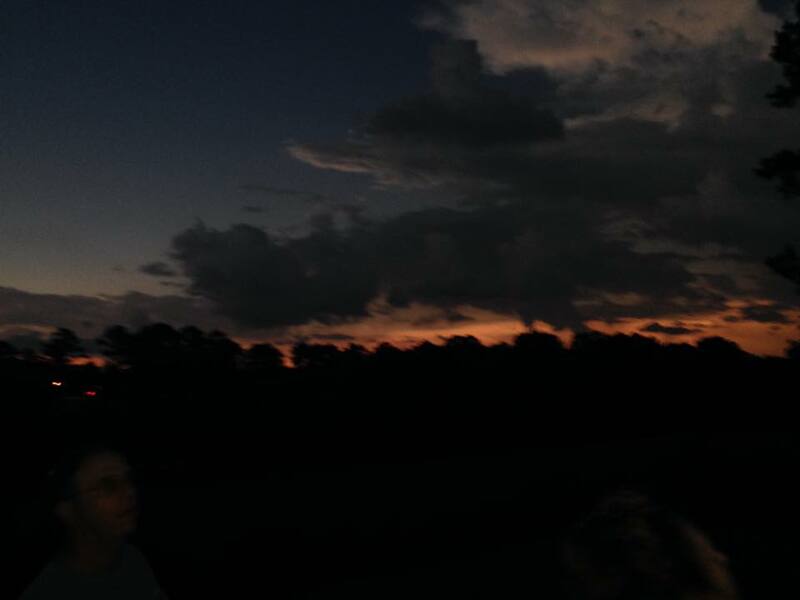 But we were able to see a few stars, and the surrounding homes were all dark. The moon appeared black with just an outline of the sun surrounding it. 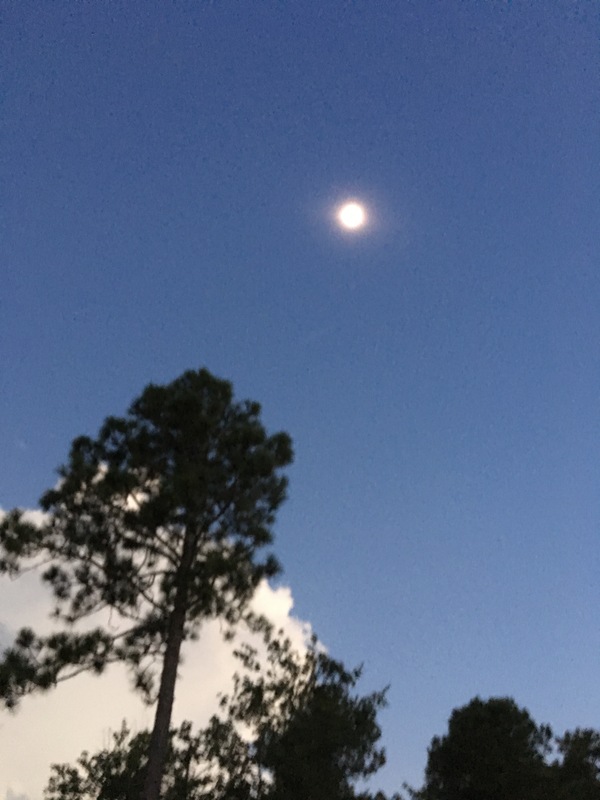 The air cooled approximately 10-15 degrees, and then suddenly, when the 2 ½ minutes of totality was complete, it got bright very quickly and we could hear the sounds of birds singing. None of us was disappointed. I held back tears. It was truly a moving experience. The next morning at breakfast, we researched the details of the next total solar eclipse in the United States, which will be on April 8, 2024. I suggested a reunion. Where should we go: Austin, Texas, Erie, Pennsylvania, Montreal, or Vermont? I guess I have become an umbraphile. Who else is interested in chasing another total eclipse? My great grandfather prided himself in having the latest gadgets, but Grandma’s father did not have the financial means to indulge in any luxuries except for the 10-inch television he bought through easy monthly payments. Beyond that, he was lucky that he was able to provide for the basic needs of his large family, although sometimes relying on income from his children. Look around today and you will see how common it is for even young children to have gadgets such as the IPad and electronic toys. It is a different world. This past week, we had solar panels installed on our roof and extra insulation added in our attic. We are now awaiting the official A-Okay from the county electrical inspector so that we can begin producing our own electricity. 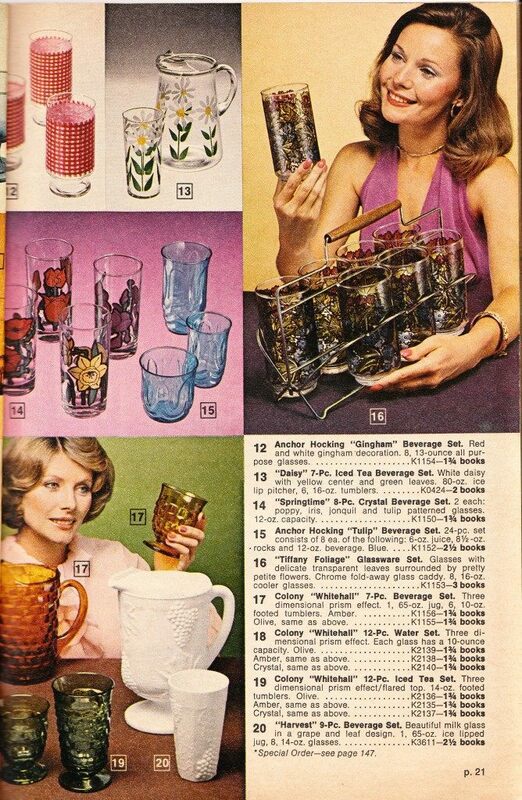 This is definitely the coolest gadget we ever owned. 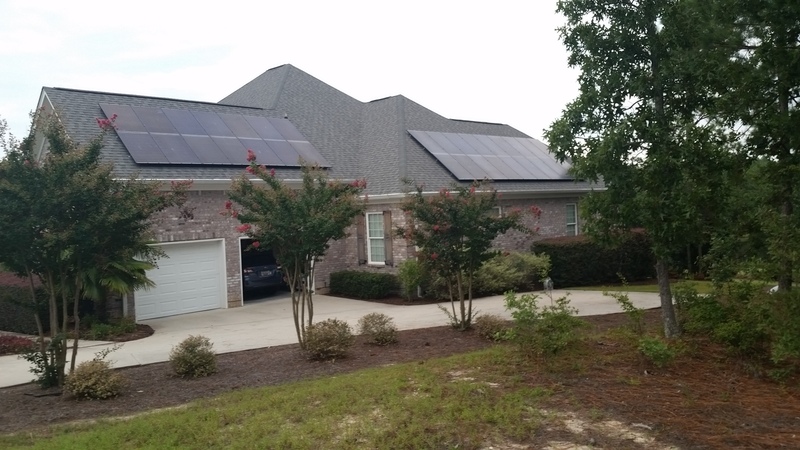 While I am a bit uncertain regarding the science of how this will work, we have done enough research and spoken to several very happy solar customers—one who is producing so much electricity that he gets a rebate from the local electric company—that I agreed with Dad to move forward with the installation. Bryce stopped by today and saw the panels on the roof for the first time. Naturally, as is customary for a four year old, he asked what they were, and I pathetically attempted to explain the process, which was difficult given my lack of total understanding of the science. For now, he was satisfied in knowing that the sun was helping us to power everything in our house which is plugged into the wall. I look forward to seeing the fruits of the work as exemplified by my very low electric bills. Maybe my home, which is in the sun over 12 hours/day during the summer, will produce all my electricity. Watch here in a few months for updates. We all have different ways to choose our credit card companies. It may be because of an affiliation with our bank, the cash-back rewards or airline miles given for our purchases, or maybe because it is just the only one who will give us their card. There was a time when our grocery and gas purchases resulted in a different reward, which was both a reward and an activity. We were given stamps, which we then had to paste into a book. There were 24 pages in a book and 50 stamps on each page. Do the math and you will see that each book contained 1200 stamps. We would redeem these stamps for gifts such as towels, glasses, jewelry, furniture, and toys at your local Green Stamp Store. It was probably one, if not the, first customer loyalty reward of its time. People would choose their grocery stores based upon the number of stamps one could get for their purchases. It could take close to a year to fill two or three books. Like the JC Penney catalogs you are all familiar with, the S&H Green Stamp company had catalogs filled with their products, including the amount of stamps needed to get such treasures. I remember going to a Green Stamp Store with Grandma as a kid, and then later with Dad. He recalled getting Green Stamps when he would rent cars during his business trips. Dad thinks we “bought” a small grill with our stamps. Although no longer available in the original stamp format, the company still exists and has gone digital in stores such as Barnes and Noble and Sephora, which give Greenpoints. It’s something to consider if you want to go modern retro. In a little more than a week, at 2:41 pm on August 21, we will be experiencing a total solar eclipse. If all goes as planned and the sky is not encumbered by clouds, the stars and planets will be visible, farm animals may return to their barns, owls may awaken, and bats may take flight. 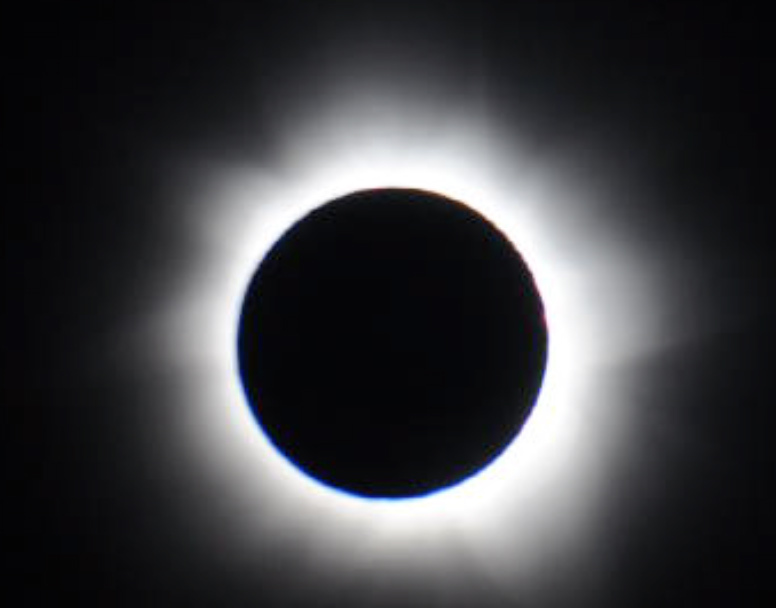 So in anticipation of this extraordinary event, visitors from four states are descending on our household to experience 2 minutes and 36 minutes of darkness in the middle of the day. I have cleaned every room, planned our meals, baked, shopped, and even created a playlist of sun/moon related songs such as “Here Comes the Sun”, “Don’t Let the Sun Come Down on Me”, “Mr. Moonlight”, and “The Sun Ain’t Gonna Shine”. Obviously, I bought plenty of beer, wine, and soda. Dad and I went to The Columbia Visitors Center and picked up fifteen pair of eclipse-viewing glasses. I checked to be certain they were not counterfeit, which would have been disturbing considering the source of the purchase. When you are expecting houseguests, suddenly you look at your home with a different eye. I realized my towels were a little ragged, and the sheets on the guest room beds were thin, so I replaced them. I made reservations at some nearby restaurants, and planned excursions around town. So in our small way, we are helping the local economy. It turns out that my memory erased some of the “uncomfortable” details of my first visit to the White House. (Inspiring—Not a Dump) Cindy’s more youthful brain was able to fill in the blanks of our evening visit to that magnificent house, and her version explained why I was so uneasy when I arrived at the side door. Don’t you remember when “someone” had the great idea, as we were passing the open gate of the East Entrance of the White House, of just walking onto the grounds? Suddenly, two agents jumped out at us—one with a gun—and stopped us and wanted to know what we were doing there. We told him we had come to get the tickets, and then I admitted (ok, so it was MY great idea!) that when I saw the open gate, I decided we should enter the grounds. That’s when the one guard called ahead and sent you in to get the tickets while I waited. When you came back, they asked us if we were interested in going to some club in Georgetown later that evening. I thought you were going to kill me after that! I remember one of us asked if President Ford and his sons were in the White House, and they said the president was out of town but flying in that evening. That’s why the gates were open. The helicopter came in that way, so I guess they needed to open the gates for more room—or did back then. So I guess I can now understand why I felt so unsettled. You must admit that Cindy’s version is far more exciting than mine. Boy, security has certainly gotten tighter since those days. Our little escapade did not even make the evening news.